Jacques Cousteau first penetrated into its depths in awe and wonder that is reflected in his well-versed quote- "I have seen no other places like Sipadan, 45 years ago, but now no more. Now we have found an untouched piece of art" during his expedition across the Sulu-Celebes Sea. 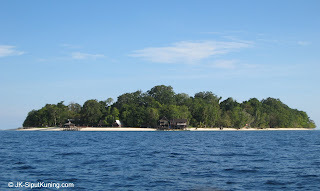 Superlative descriptions have been a common "trademark" for Pulau Sipadan. 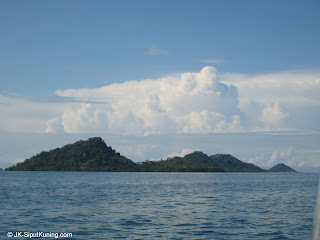 Everyone who have visited this 12 hectares island carry their own accounts of adventures, each as amazing as the other. However, underlying all these colourful stories is one that many have not ventured into yet, a story that is as grand as its coral reefs - The Story of the Evolution of Pulau Sipadan into the island we know today. Semporna town near Pulau Sipadan. 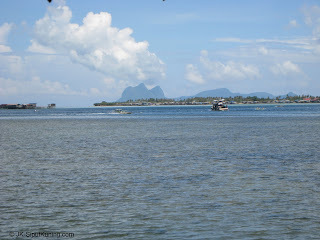 The flatland across the shallow strait is Pulau Bum Bum and the tall imposing peaks behind it is Pulau Gaya and Pulau Boheydulang. 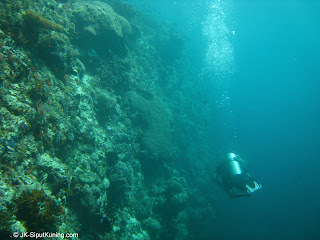 Beyond the acknowledgement of Pulau Sipadan as a oceanic, volcanic sea mount in tourists brochures, little else about its origin is mentioned. So, to fill this information gap that some visitors (including me) may wonder about, I've done a small online research to analyse and share this particular island's history with everyone. The following may not be a complete description of the island's formation but nevertheless, it sheds some light to this legendary island's origins. 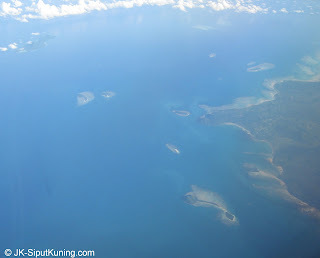 To fully understand the geological history of Pulau Sipadan, we have to look at the bigger picture that is Sabah, the continental tip of Northern Borneo. Turning the clock back to more than 65 million years ago, much of North Borneo was submerged under deep waters. 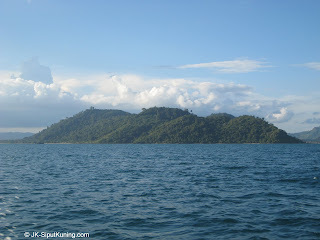 As the Tertiary period (65 million - 2.588 million years ago) begins, the first lands can be seen breaking the cerulean waters in the form of a chain of islands that resembles much more of a growing underwater mountain range of what is now the tallest in Borneo- the Crocker Range. As time progresses, clouds bringing storms and rains washed the slopes of these majestic mountain-islands, thus distributing alluvial deposits along the coast until these islands became linked. Mount Kinabalu, at 4095m, is the tallest peak in Crocker Range at present day. 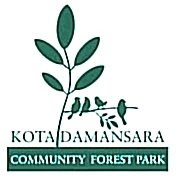 Kinabatangan Delta of present day Borneo gives us a glimpse of what Central Borneo used to be like. The Eurasian Plate is where the Sundaland (the shallow, light blue area) is. The Philippine plate can be seen as a dark (deep) area off Northeastern Borneo. The movement of Philippine plate against the Eurasian plate north of Sabah further pushes the mountain range higher and higher while creating a wide floodplain to the east with soil runoff from the highlands during the Miocene period (23.03 - 5.33 million years ago). Meanwhile, the same Philippine plate in the southeastern end of North Borneo starts to drift apart from the Eurasian "mainland", causing a rift and sets off the red hot lava bursting out of the cracked Earth crust from the deep magma below. Soon, the deep seas off the developing floodplains east of Crocker Range (now Central Sabah) were boiling hot with lava and pumice bursting out of the surface all the time. This will soon form most of Eastern Sabah, in which the Semporna Peninsula will emerge from the thick clouds of volcanic ashes. Remains of ancient volcanoes in Tawau, west of Semporna. Volcanic rocks of Tawau indicates the region was once highly active in volcanic activity. Low tides exposes ancient volcanic pumice and rock deposits (dark brown areas) along mainland Semporna and Pulau Bum Bum. 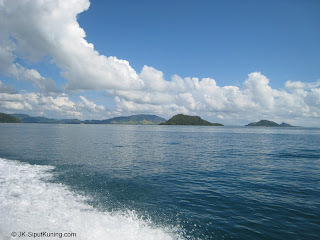 Across the 100m tall developing volcanic cones along Semporna Peninsula, ashes spews and radiate out into the ocean and the ancient floodplains of Central Sabah, joining nearby islands and expanding its landmass. However, further out in the deep ocean off the edge of Eurasian Plate, an undersea volcano far removed from the bustling volcanic activity miles from it, silently build in height. Forwarding the frame in a year per second, one would see steam rising out from the deep Celebes Sea and then, a dark mass of rock and pumice pops out of the surface and extends in width and height. Pulau Sipadan is born. 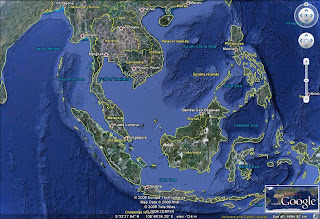 Since it is separated from mainland Semporna by deep waters, the lowland sediments of Semporna never made it to Sipadan. Volcanic rocks exposed on Pulau Menampilik off Semporna. The chain of islands off Southeastern Semporna with prominent exposed volcanic rocks. Sometime later, the lava flows and plumes disappeared and volcanoes silenced. 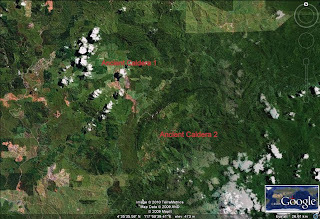 Clumps of greenery previously existed only in areas of least volcanic activity flourished and spreaded across the landscape. Gradually, the dark rocks of past ages got smothered in rainforests and mangroves, only occasionally protruding as hardened lava cones at higher peaks. Ashes not covered by vegetation end up being washed away by rains and wave action of the sea. As time progresses, the ice age of the Holocene (approximately 12000 years ago) arrives. As if a plug in a basin of seawater is being pulled, sea levels bordering the peninsula dramatically retreated 120m below sea level. Thus, "raising" the badly worn volcanic peaks of Semporna some 100m above that era's shoreline. 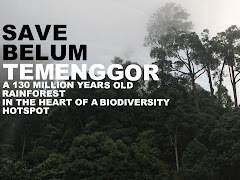 Across the narrow band of water, Sipadan stood as a lonely, weathered and extinct volcano draped in lush forests on its slopes and coastal grasslands along it's coasts. During this time, some ancient fauna and flora might have migrated to the island through the deep but short passage of sea. 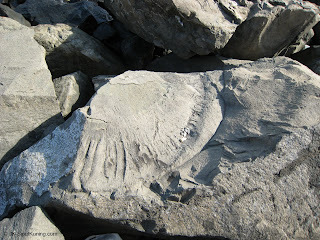 There may be corals fringing the ancient coast as well. Fertile soils encourage rapid growth of rainforests across the volcanic slopes of the mountains on mainland Semporna. Manado Tua of North Sulawesi, Indonesia. 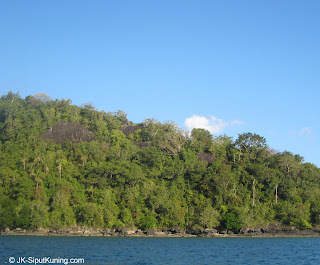 Pulau Sipadan was once similar in appearance to this island when it was a volcanic mountain island many millenia ago. Bukit Tengkorak with a volcanic outcrop, near Semporna town. The sign of an ancient volcanic land. Fertile lands on the southeastern tip of Semporna Peninsula is the testimony of the volcanoes around the area. 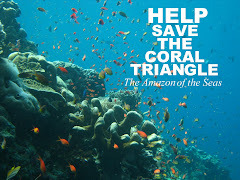 Corals are the building blocks of Sipadan's limestone. Approaching 6000 years before present day, the ending of ice age marked another dramatic event- the increase in sea level or mass-flooding. Once again, lowlands shrinked and forests of the past disappeared below the waves. The seawater soon reached present day levels at 6070 years before present, only to exceed another tenths of metres of height for the following millenia. Thus, the cone became completely submerged. Corals started to form at the top most part of the seamount, growing outwards slightly below sea level. Before long, the sea levels retreated again, exposing the limestone reefs to the atmosphere and creating habitat for forest recolonisation. During this period of emergence, parts of the limestone eroded to form a complex cave system complete with stalactites and stalagmites which will be known as the Turtles' Tomb or Cave due to the high numbers of unfortunate turtles trapped and died in the labyrinths of this cave. What happens next will define Sipadan's present day characteristics. 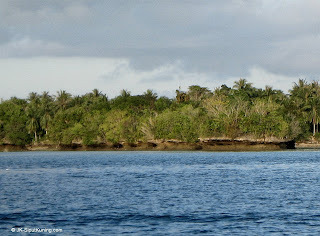 Coral-fringe islands is now part of Semporna's modern feature after the sea level rise. The island chain in the foreground used to be high and dry with grasslands dominating valleys between them and the sea as well as mainland Semporna (background). During the exposure of limestone, this may be what Sipadan looked like. Picture taken in Nusa Penida, Bali, Indonesia, an island made of raised coral limestone. The submerged cave entrance to Turtle's Tomb. 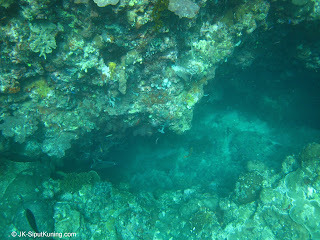 Crevices like these may be the access routes to caves lying deep inside Sipadan limestone. 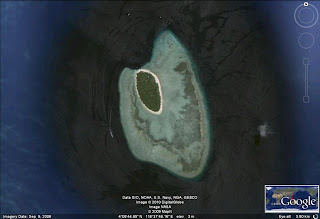 Being on a mobile, active edge of the Philippine plate, it so happened that Sipadan slides along the growing tectonic plate and the limestone forest began to submerged again, probably eliminating the terrestrial ecosystem all together. Then, polyps of modern corals settled on the ready-made reefs of craggy limestone to expand as a reef and form the strange shape of a "mushroom" along the top perimeter of the seamount. Up above water, the reefs slowly give way to a sand bank which accumulates and grows as time passes. Birds and storms bring driftwood, sea beans, plants and animals to colonise the sandy island. 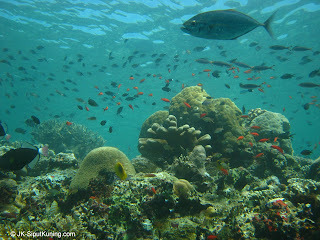 Finally, the ecosystem of coastal forests and coral reefs reached their climax that is Pulau Sipadan today. 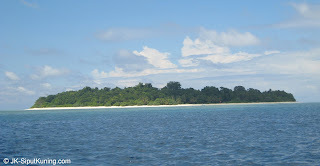 The sand bar formed near Semporna show what modern Sipadan was like in the initial stages of development. 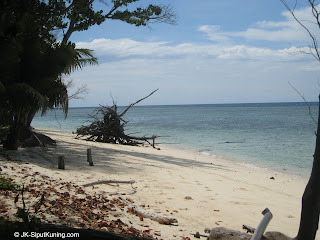 As sand accumulates, the land mass increases and vegetation flourishes as shown here in Pulau Mabul, near Sipadan. Driftwood washed up by storms brings in many flora and fauna from nearby terrestrial ecosystems. 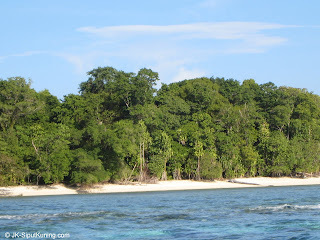 The product of millenia of colonisation by terrestrial flora and fauna- the dense coastal forest of Pulau Sipadan. 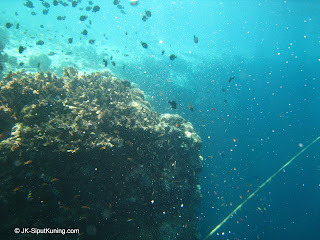 The famous vertical drop off of Sipadan. Could this be the upper part of the "mushroom" structure? 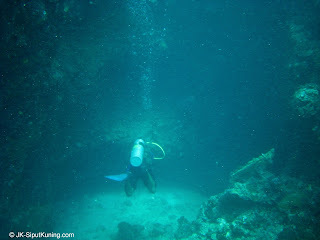 Diving along the ancient limestone cliff. 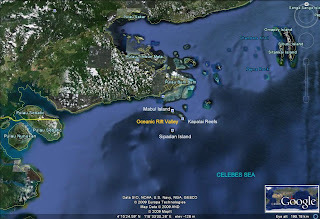 Sipadan today as seen from above (Google Earth). 5.Mohd Harun Abdullah, Mazlin B. Mokhtar, Sanudin Hj. Tahir and Almah Bt. Thanks for your comments, Chai! you have a great blog too!